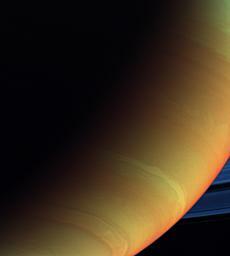 Another post card from the Cassini probe from a far-off corner of our solar system. There’s always beauty in the blackness, I tell you. This psychedelic view of Saturn and its rings is a composite made from images taken with the Cassini spacecraft wide-angle camera using spectral filters sensitive to wavelengths of infrared light centered at 728, 752 and 890 nanometers.